When it comes to cards of any kind, the most sought-after ones generally are the rookie cards. It’s the first time they have ever appeared on a trading card, and if that card happens to have been produced in a rather limited quantity by the company, all the better. Of course, the value of a rookie card also depends on the player – a surefire Hall of Famer is going to be more valuable than someone who was on the ice for 20 games. The best of the best hockey rookie cards that we'd call 'vintage' is Wayne Gretzky’s O-Pee-Chee 1979 -80 issue, which has sold for tens of thousands of dollars in the highest grade (most are much, much less expensive, though). Gretzky’s Topps rookie is obviously very popular as well. Prices vary wildly based on condition. Gretkzy’s OPC rookie is about five times more valuable than his Topps rookie. A mint 9 Topps can usually be had for around $1,000. Other strong rookie cards of the post-War era have included the 1951 Parkhurst and 1954 Topps Gordie Howe; the 1966-67 Topps Bobby Orr (very hard to find in high grade), 1986-87 Patrick Roy, the 1951 Parkhurst Terry Sawchuk and Maurice Richard and the 1958-59 Topps Bobby Hull. Don’t have several months of rent for many to spend at once? You can go down a tier or two to get cards of players like Ken Dryden (1971-72 Topps), Martin Brodeur, Al MacInnnis (his O-Pee-Chee is worth $30), Grant Fuhr (his O-Pee-Chee rookie is worth around $40), Ray Borque(his O-Pee-Chee rookie is worth up to $130 in the highest grades) and Mark Messier (his O-Pee-Chee rookie goes for as much as $180) to name a few. You could just decide to target the rookie cards of players from a certain era – if you’re an Islanders fan, you could always collect the cards of players from those ‘80s teams. Do whatever you want to do that suits your tastes and your budget. We're not including any of the cards from the 90s and up here--strictly older stuff. When it comes to the best hockey rookie cards, if your budget isn’t an unlimited one, you are still in good shape with many of the ones listed above. 1951-52 Parkhurst #66 Gordie Howe Rookie Card -- SGC 88 Well centered! 1954 Topps Gordie Howe #8 PSA 8! Beautiful premier of first Topps hockey card! 1954-55 TOPPS #8 GORDIE HOWE ROOKIE - SGC A - AUTHENTIC (SVSC) - NICE! 1966 67 TOPPS #35 BOBBY ORR ROOKIE BGS BVG 10 PRISTINE!! 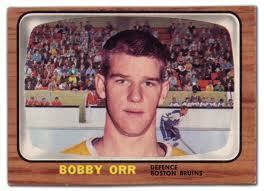 1966 67 TOPPS #35 BOBBY ORR ROOKIE CARD PSA 7 NEAR MINT! 1951-52 Parkhurst #61 Terry Sawchuk Rookie Card SGC 92 NM/MT+ Perfect centering! 1958-59 Topps Bobby Hull Rookie #66 PSA 7 Plus Howe 8 and Near Set !